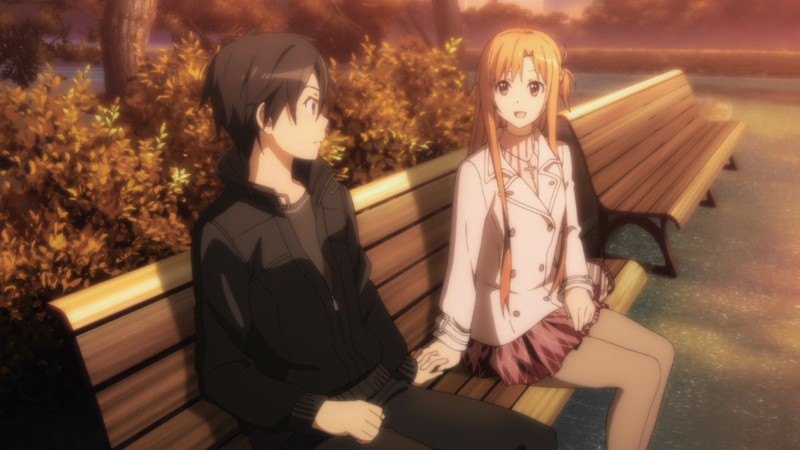 Sword Art Online hit massive popularity two years ago when the first season of the anime adaptation released. 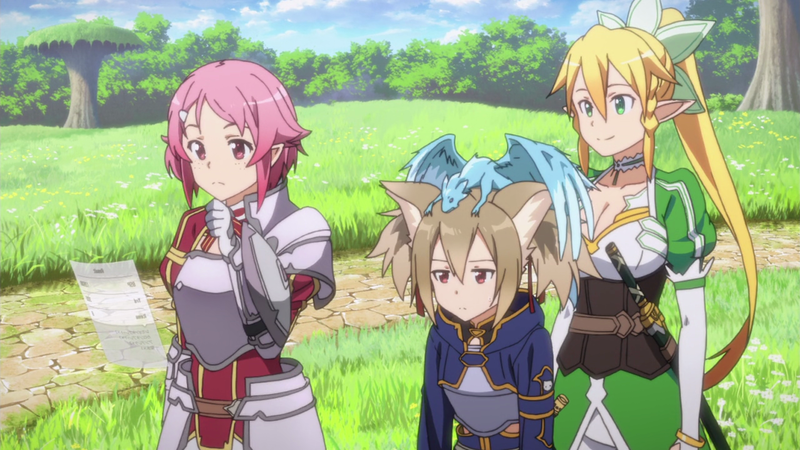 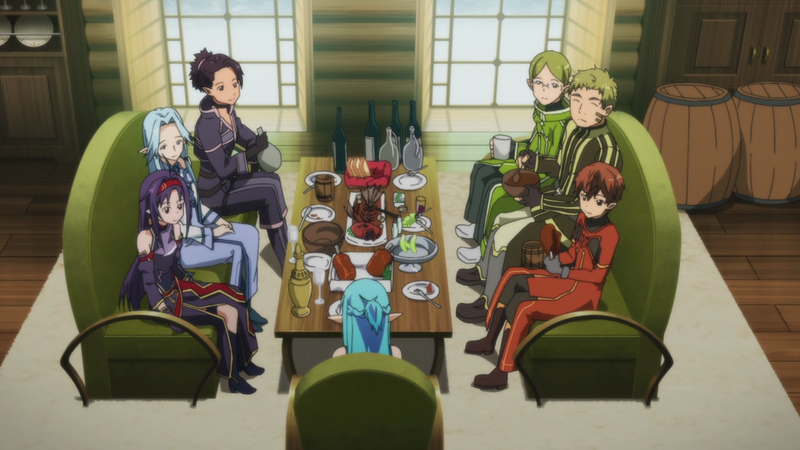 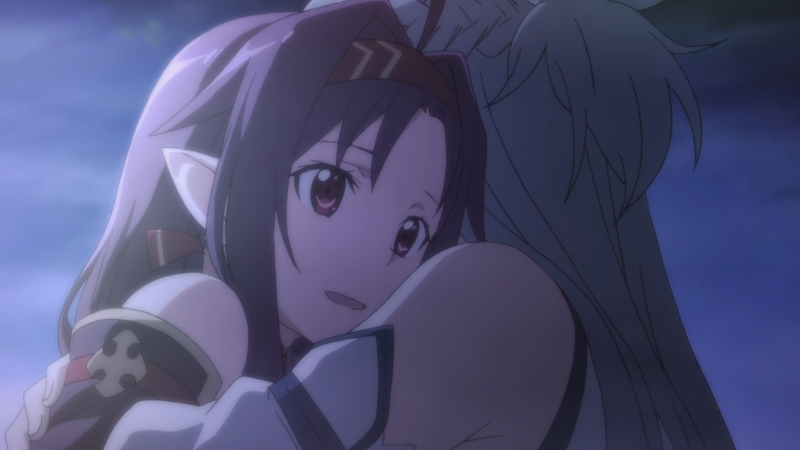 Starting out in an online world where the characters are trapped and will die in the real world when they die in the game, Sword Art Online looked like it could effectively examine our relationships with others in games and what would happen in dire consequences. 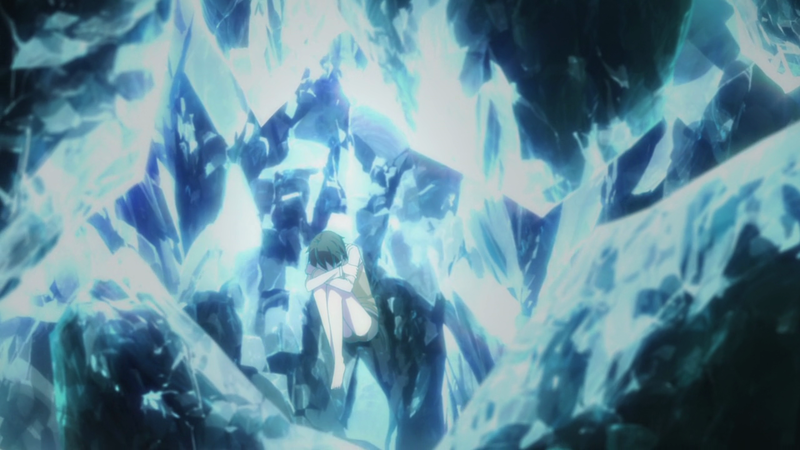 The idea wasn't new - several other anime have covered the horrifying circumstances of being stuck inside a game - but it was at least an entertaining ride for the most part. 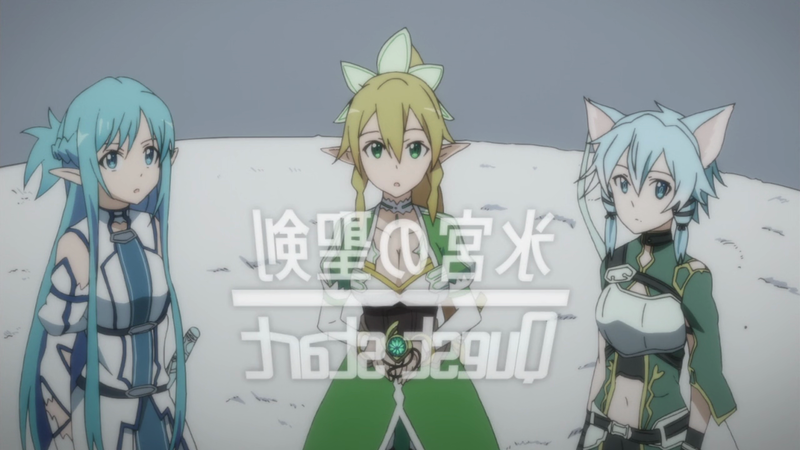 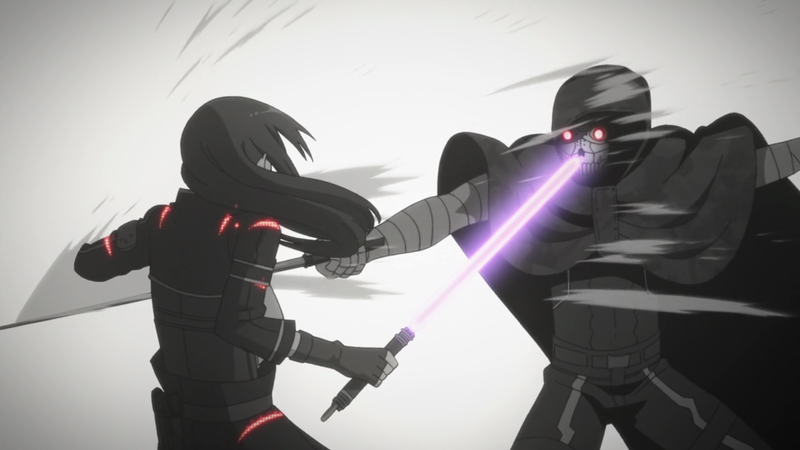 The second season introduces one new game and revisits the game Kirito plays in the second half of the first season. 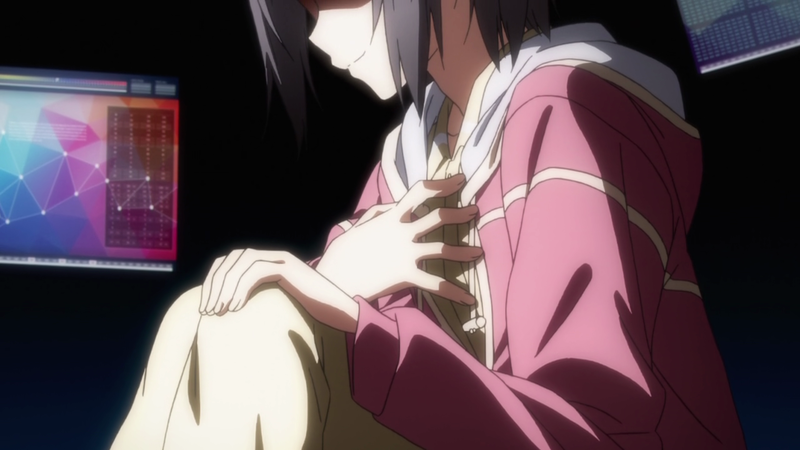 Unfortunately, the show gives few reasons to actually care. 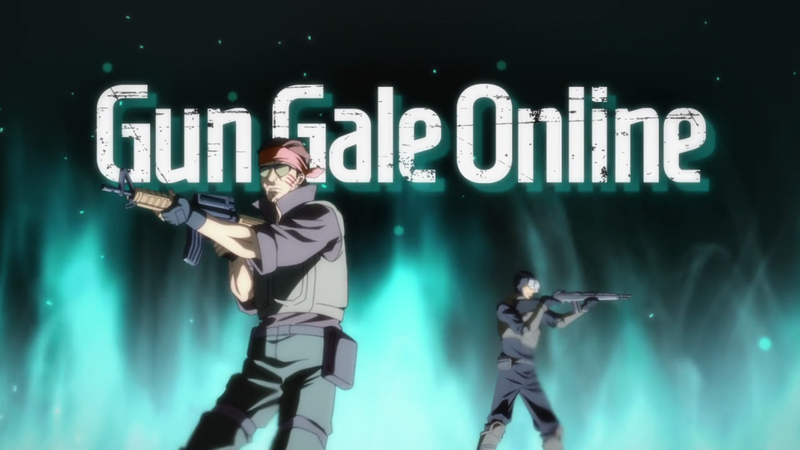 The second season begins with a new virtual reality MMORPG called Gun Gale Online. 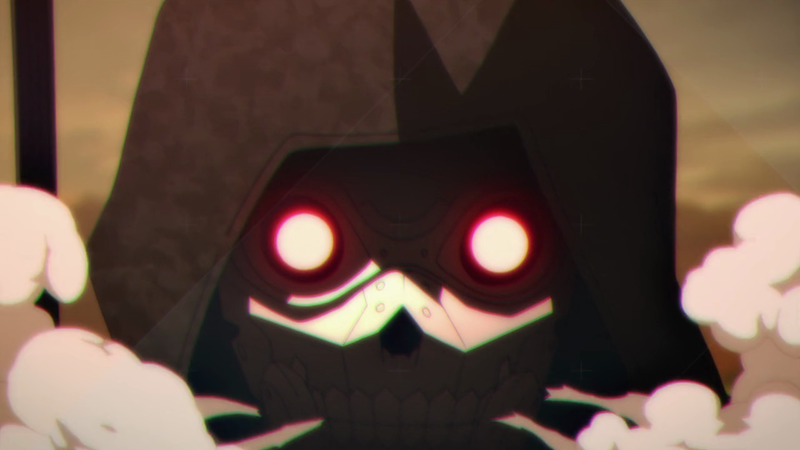 Rumors are circulating about a person named Death Gun who can fire a bullet in the game that will also kill people in real life. 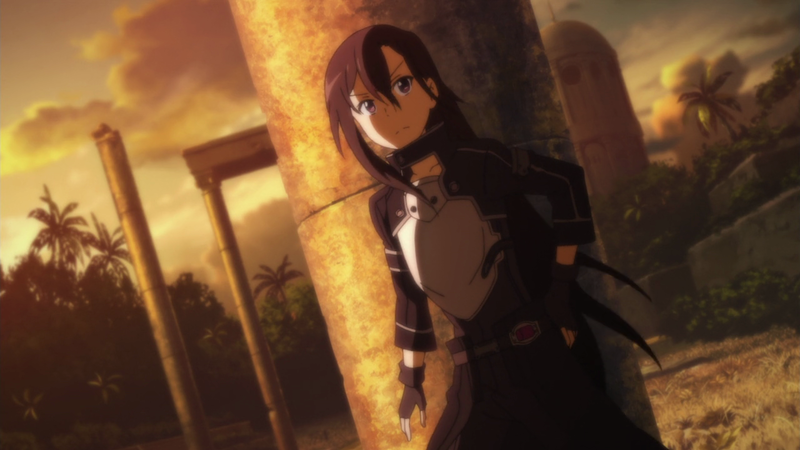 Kirito, the protagonist of the last season, starts working with the Ministry of Internal Affairs to investigate whether such a thing is possible. 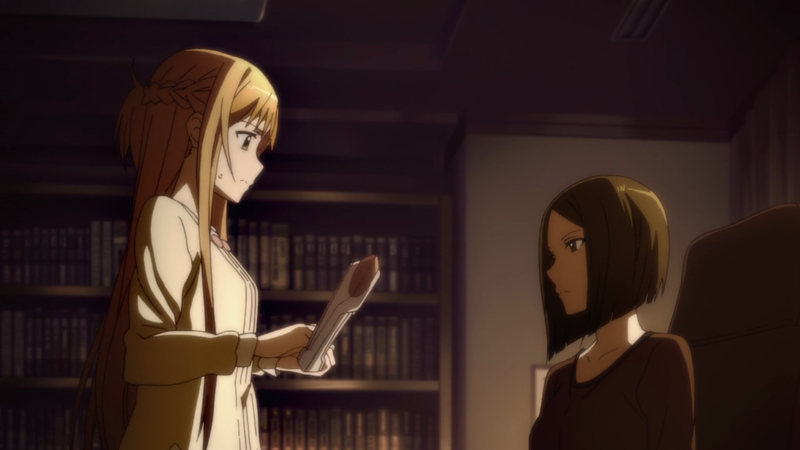 This arc starts off as a mystery, but it suffers from pacing problems that make it hard to keep an invested interest. 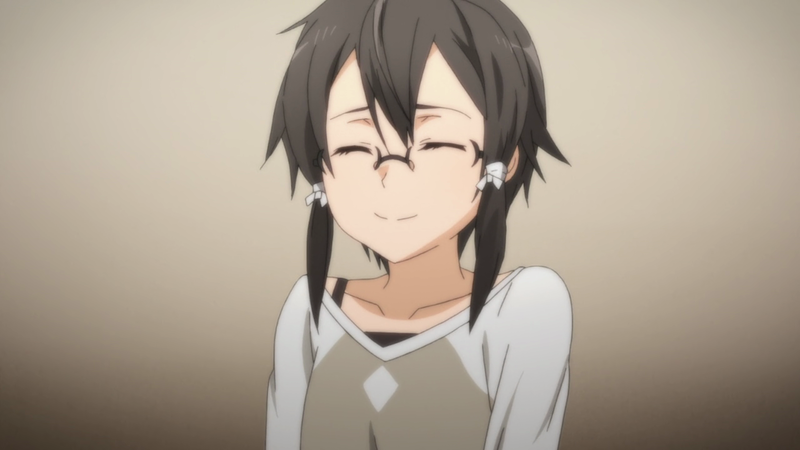 The deuteragonist, Sinon, is an avid Gun Gale Online player. 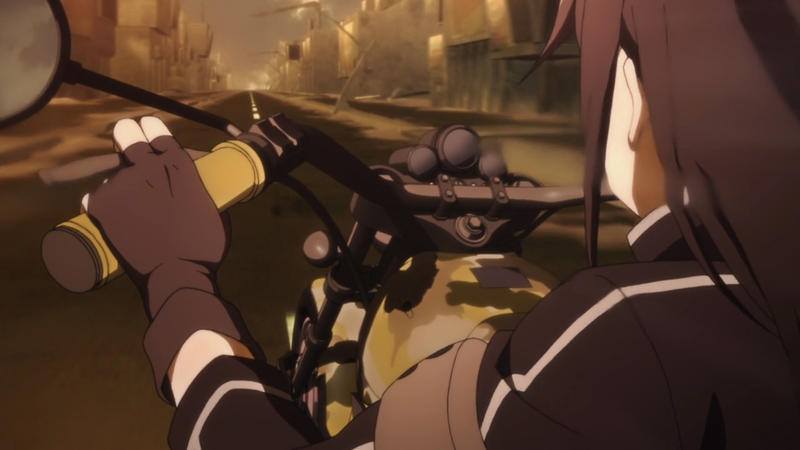 She's a well-known sniper in the game, and she even plans on competing in a competition with the silliest name imaginable (Bullet of Bullets). 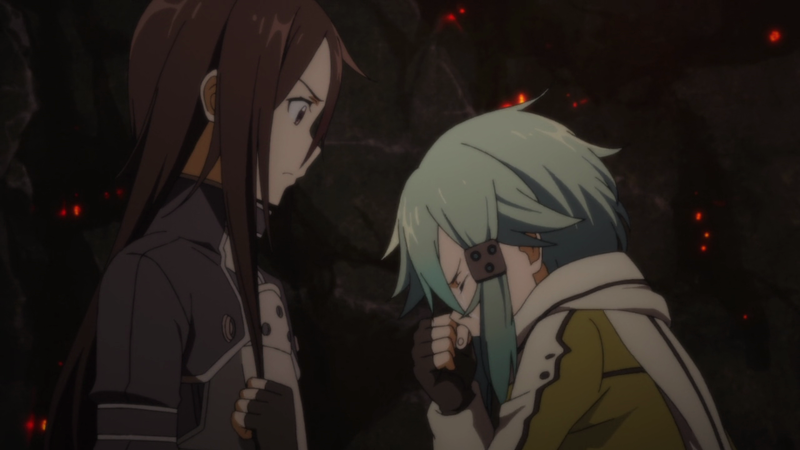 Kirito and Sinon end up working together as Sinon helps Kirito find Death Gun, and Kirito helps Sinon through her fears. 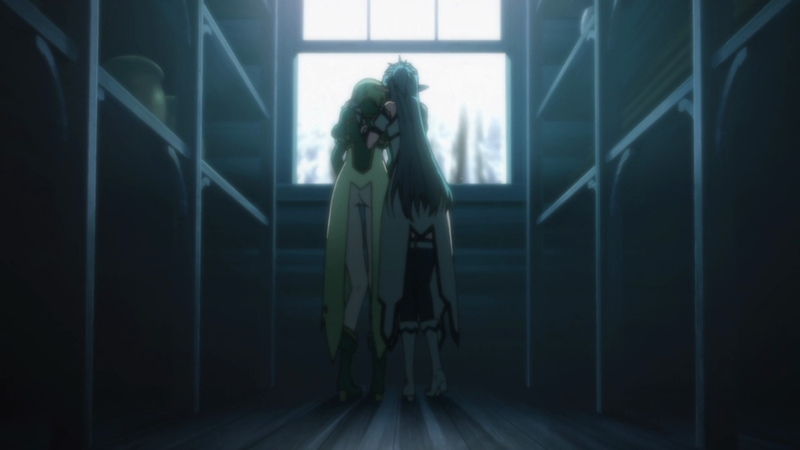 When Sinon was a young girl, a man barged into the post office and aimed a gun at her mother. 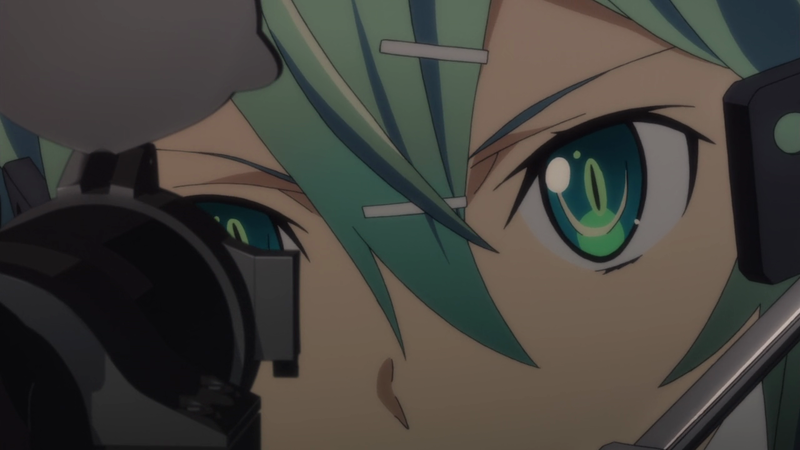 Sinon managed to take the gun from him and shot him. 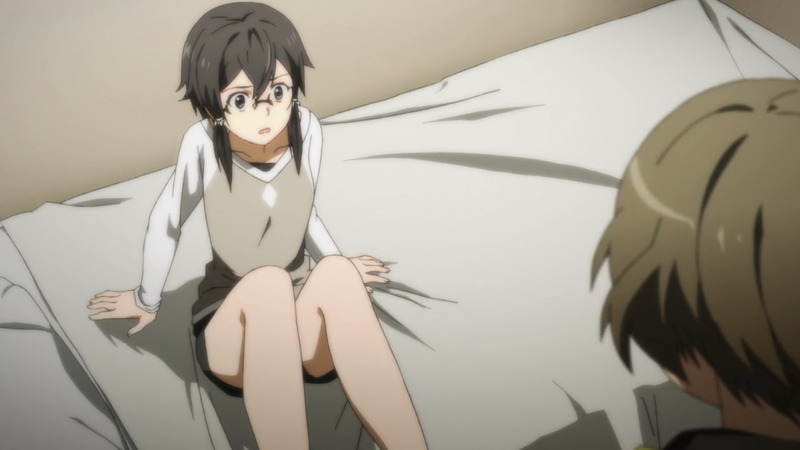 Because of this event, Sinon is terrified of guns and is playing Gun Gale Online as immersion therapy to conquer her fears. 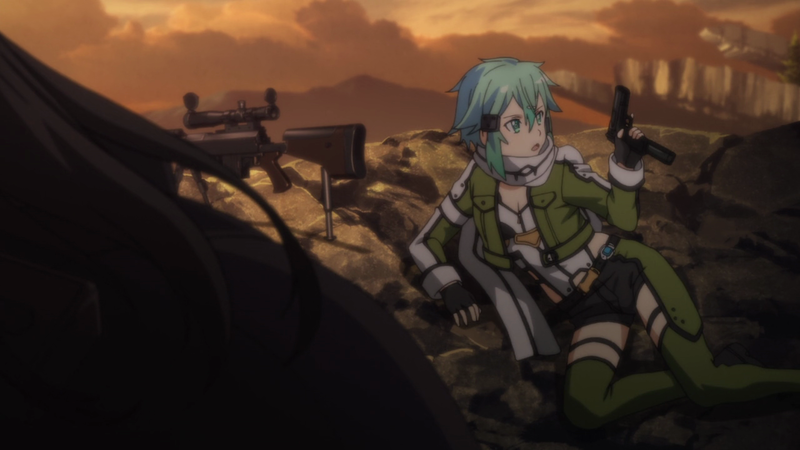 Sinon's stress triggers whenever she comes into close contact with guns or realistic replicas. 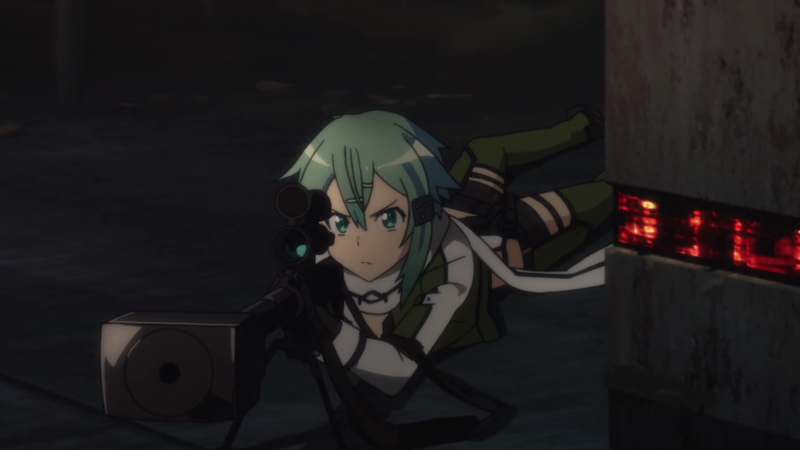 At first, this seems like a well done representation of a trigger - Sinon panics when she tries to hold the gun replica she keeps in her desk at home. 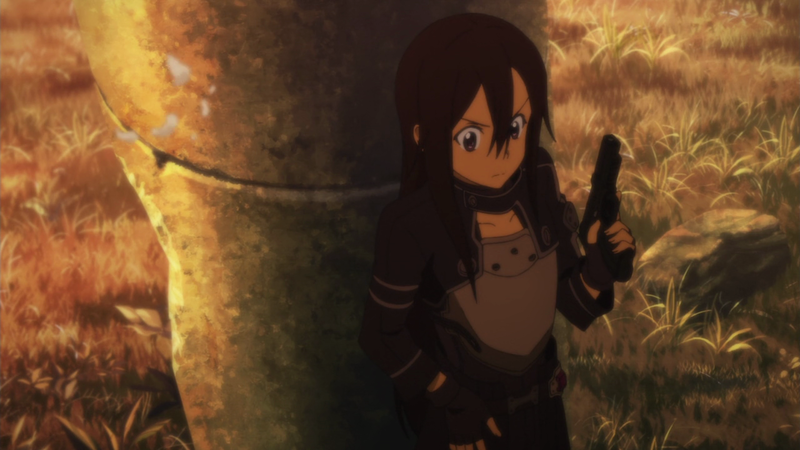 Her breathing becomes labored and she can only remember how terrified she felt the time she held a gun and killed someone. 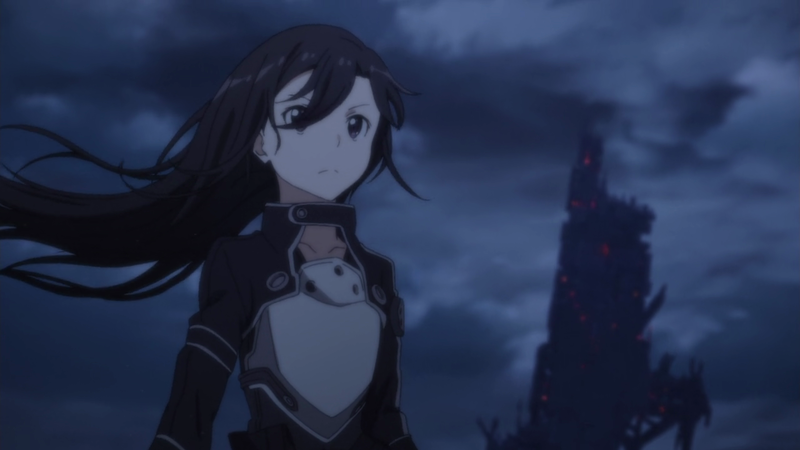 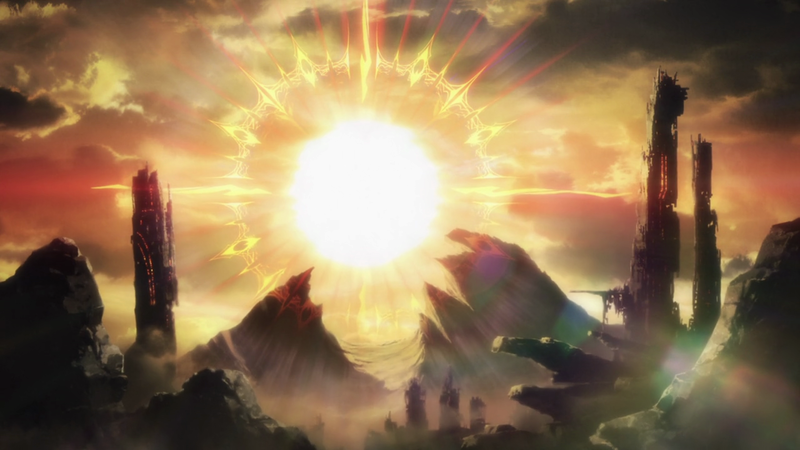 It's surprisingly dark for Sword Art Online, and the show would have pulled it off had it not done it in such an overdramatic manner. 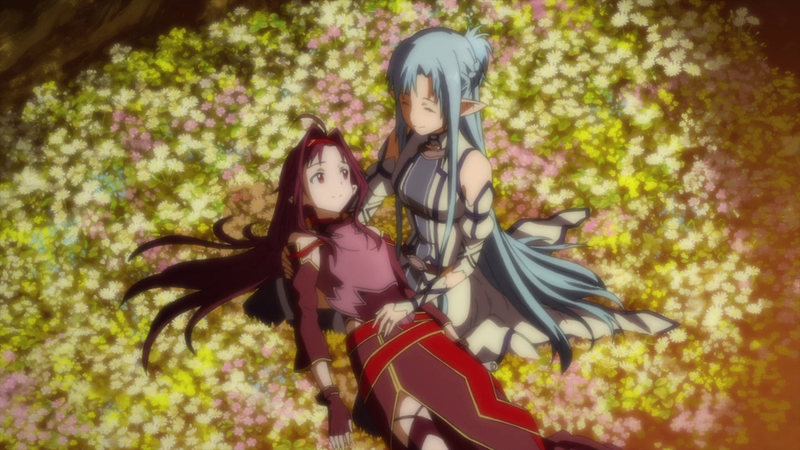 The over the top, highly saturated red in the background and an unreasonable amount of blood flowing across the floor distract from the terror Sinon feels. 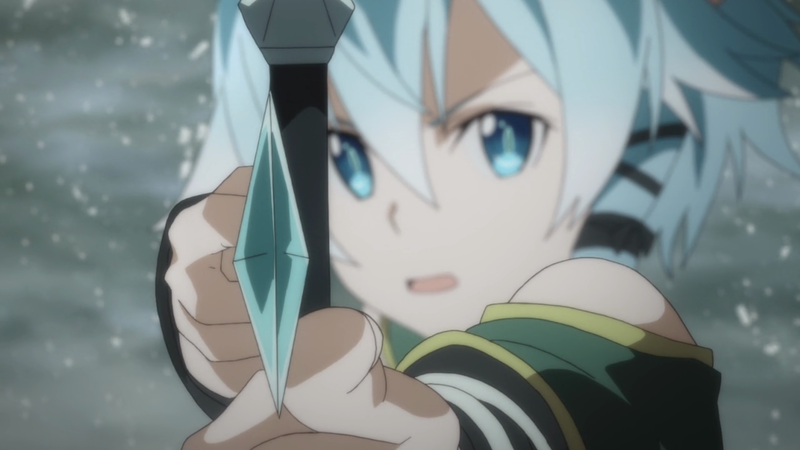 Sinon is still a breath of fresh air in a show like Sword Art Online, which feels like it honestly could have ended after its first arc, halfway through the first season. 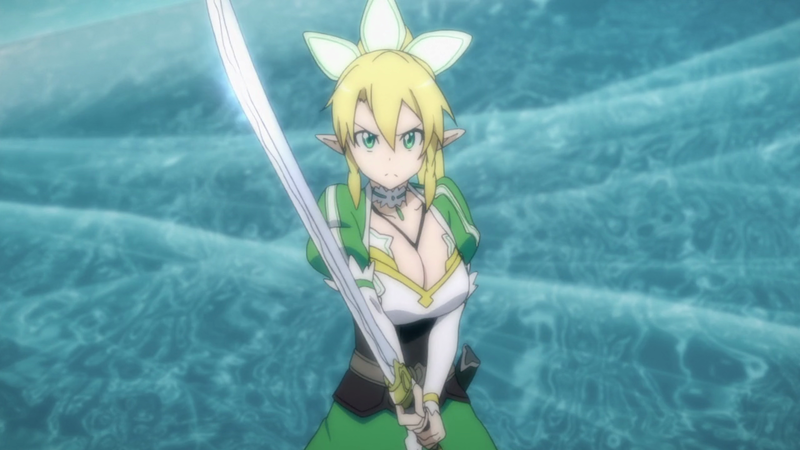 In fact, this season repeatedly reminds viewers of the Sword Art Online arc as if it's saying, "Remember the Sword Art Online you enjoyed? 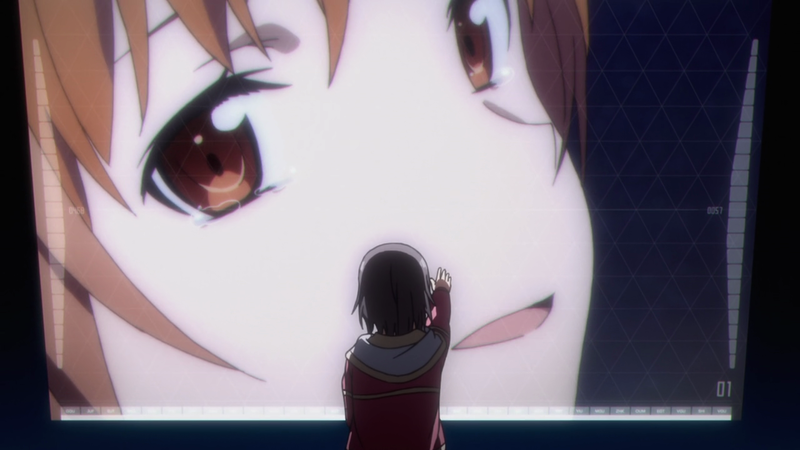 We're going to keep reminding you what happened." 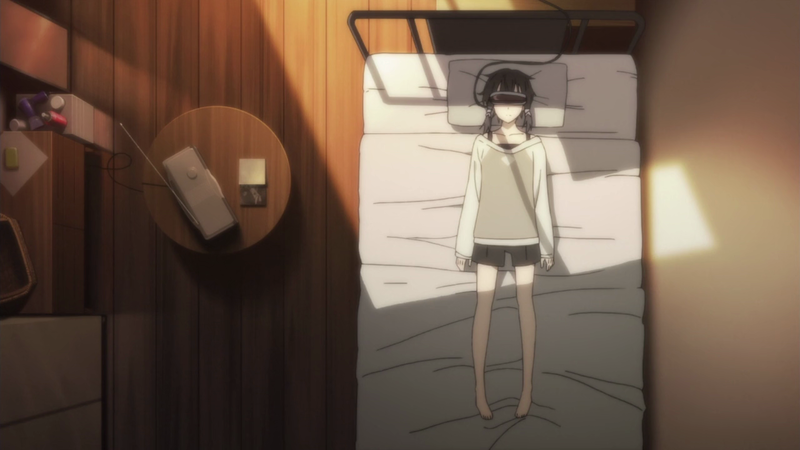 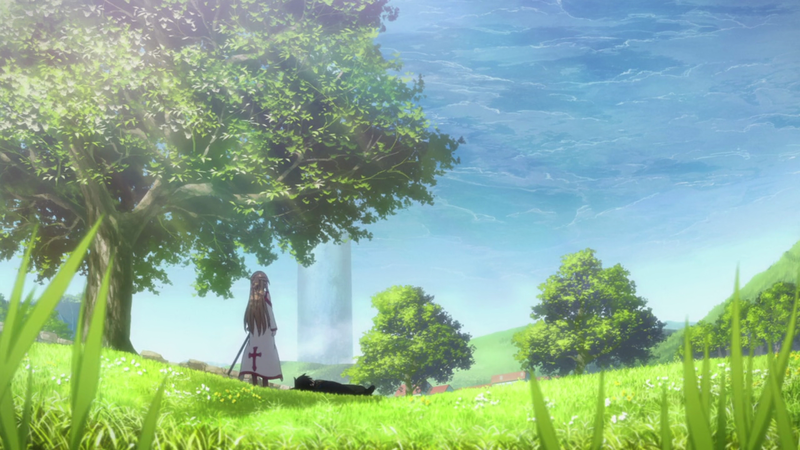 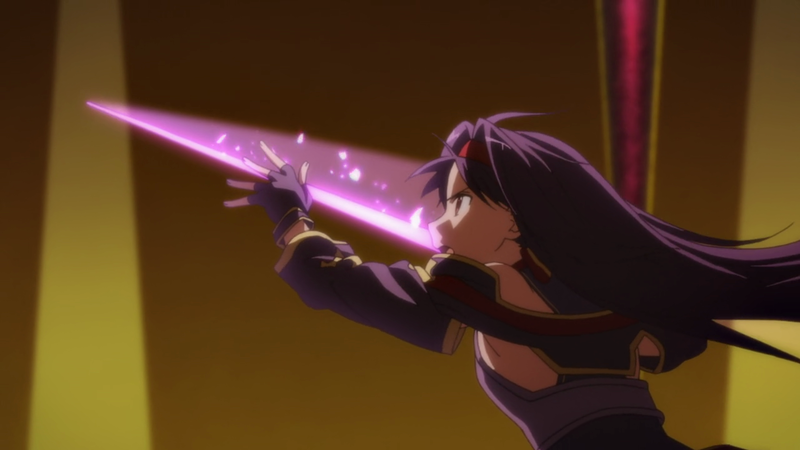 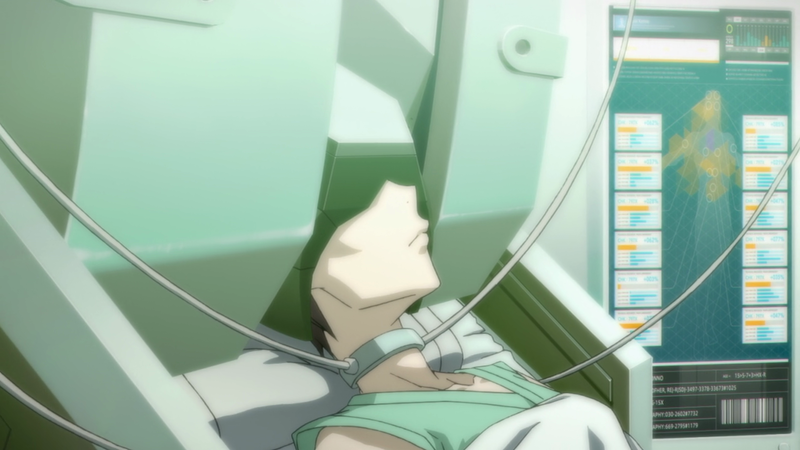 The main problem with Sword Art Online is that it has no concept of subtlety. 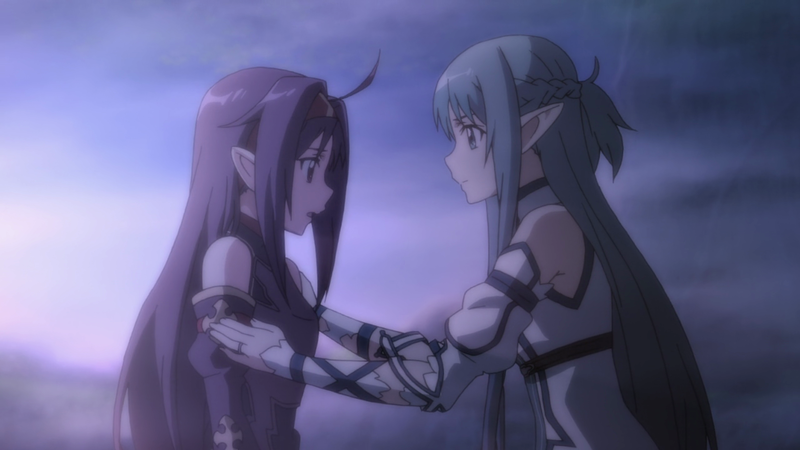 Everything must be explicit, and it becomes obvious when Sword Art Online wants to get a specific emotional reaction out of you. 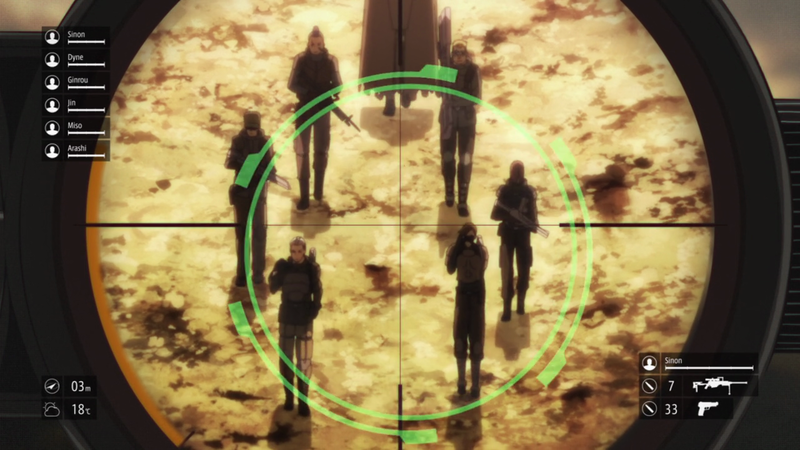 This ends up ruining the mystery plot of the Gun Gale Online arc. 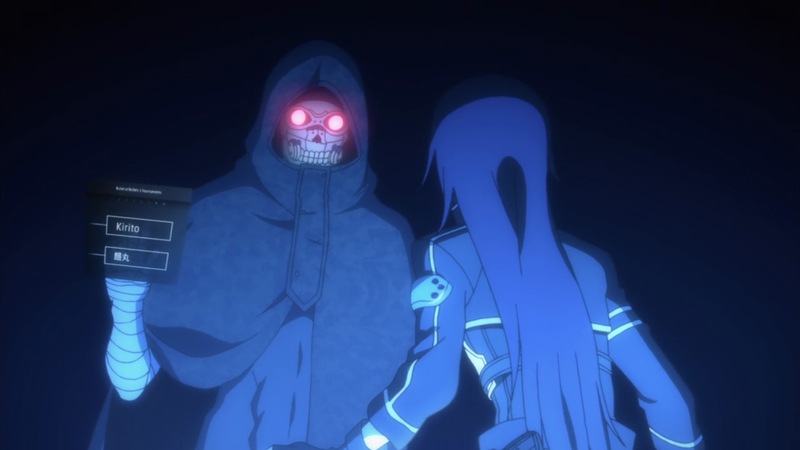 Kirito realizes the person behind Death Gun was a member of the player-killing guild of Sword Art Online and that this was someone he had fought against after killing a handful of that guild's members. 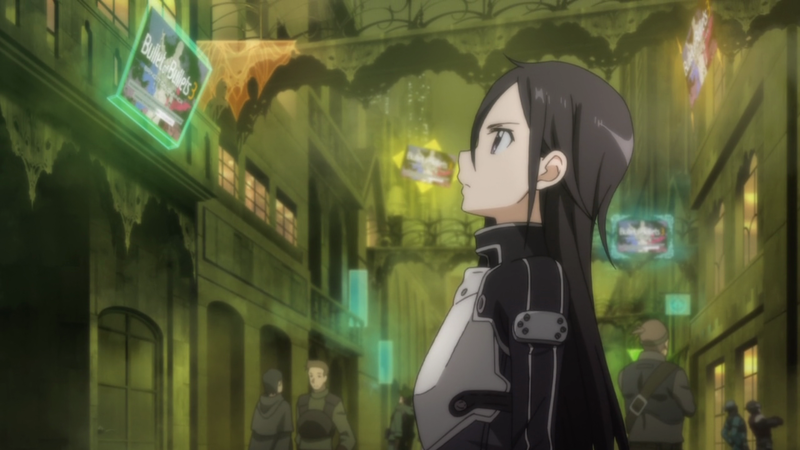 Kirito is racked with guilt as he's unable to remember the names of the people he killed. 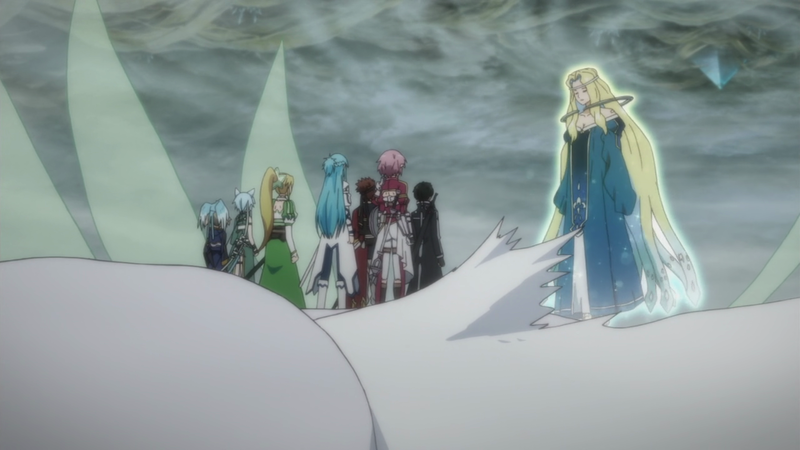 Because the arc goes on longer than it should, some sequences get drawn out so that we can see flashbacks multiple times (as a constant "Hey, remember this? 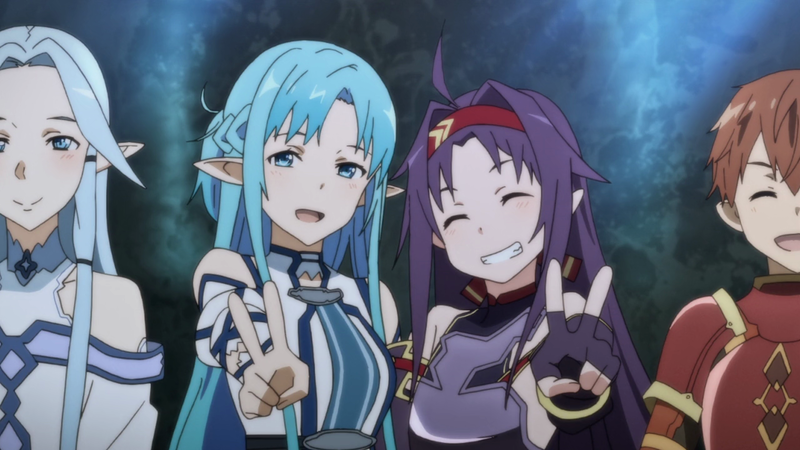 ").